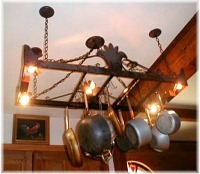 Organic Handcrafted heavy duty fully adjustable custom pot rack system. Takes 4 each high energy efficient 12v MR-11, 35watt halogen mini adjustable spots, Dual inset candelabra with stages as back lighting against ornamental detail, takes two CA-8 60watt max flame twist or CPF mini twist candelabra bulbs. Features: 4 lateral pot-hanging rails containing 5 each dual side yoke hanger hooks capable of supporting 40 pieces of cookware. Complete system is hung by 4 independent outer canopies, with single ornamental main hung canopy center. 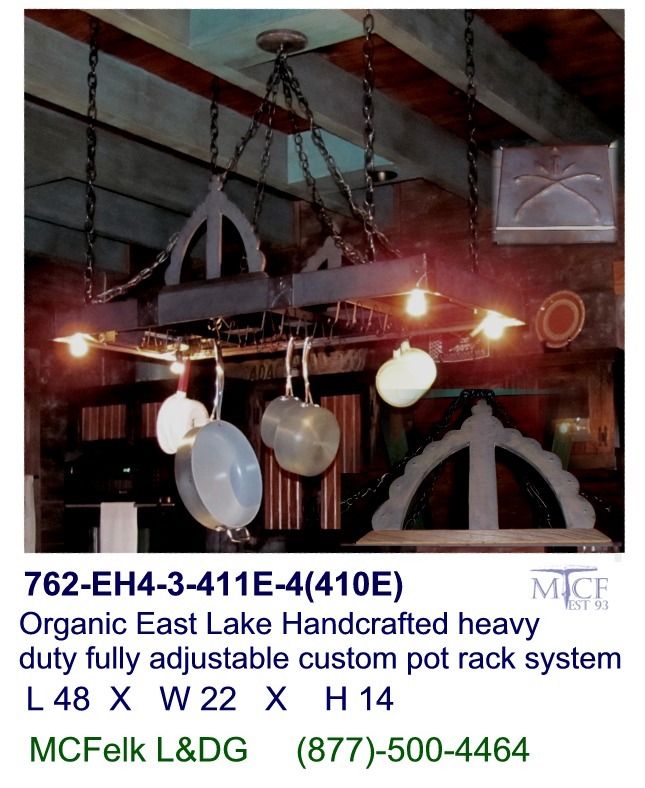 Organic East Lake Handcrafted heavy duty fully adjustable custom pot rack system. Takes 4 each high energy efficient 12v MR-11, 35watt halogen mini adjustable spots. Features: 4 lateral pot-hanging rails containing 5 each dual side yoke hanger hooks capable of supporting 40 pieces of cookware. Complete system is hung by 4 independent outer canopies, with single ornamental main hung canopy center. 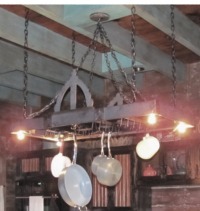 Pot rack system is unequaled in design, and features 4-point ceiling structural support as mounted to optional beam hooks or ceiling canopy mountings. 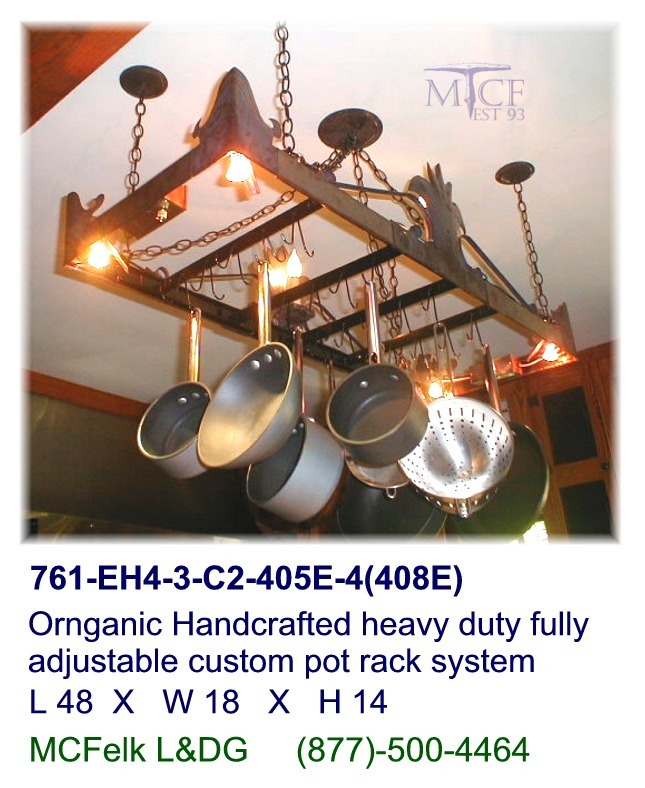 Structure is included for heavy-duty iron cookware supporting in excess of 400+lbs. Lateral rail system allows for cookware to be moved to allow functional uses of island counter surfaces, combined with adjustable 4 head MR11-35Watt halogen fixtures inside frame. Hammered custom copper, bronze, or brass ornamental details, customize accent to virtually any interior architectural landscape.